The Olympic movement has always been vulnerable to political manipulation. Host nations have used it to grand-stand their own regimes - like Hitler's Berlin Olympics in 1938; individual athletes have use it to voice their own grievances - like Tommie Smith's and John Carlos' Black Power salutes at Mexico City in 1968. The horror story that was Munich in 1972, when Palestinians kidnapped and executed members of the Israeli Olympic squad, showed the lengths that some groups might go to in using the Olympic Games to publicise a cause. 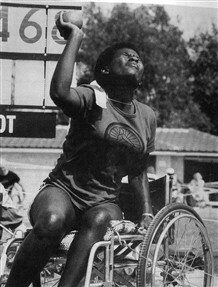 For many years the International Wheelchair Games and the Paralympics had been untouched by such politics. However this started to change after Munich and perhaps - as the movement grew in size, prestige and professionalism - there was a certain inevitability to this. More politics from the outside world came in 1978 when the Shah's regime in Iran was about to fall. By the 1980s the Stoke Mandeville Games organisers were becoming used to the events being taken over by politics. There was a minor diplomatic incident in 1984 as the war between Iran and Iraq was still being fought. But in their earnest attempts to avoid an incident the organisers only ended up by enraging a third country. In the following year, 1985, the South African team was formally expelled from the International Games at Stoke Mandeville. Dot one of the hospital physios remembers the moment. "It was the day of the closing ceremony and it was pouring with rain. It was raining so hard that it had been moved inside into the sports hall. This in itself was strange. The teams all paraded in and an announcement was made that the ISMGF (International Stoke Mandeville Games Federation) had banned South Africa from future competitions due to the continued presence of Apartheid and the political pressure that required this to happen. The South African team were inclusive of both black and white athletes and it seemed a bizarre situation. For me it felt so confusing; I guess I was naïve and unaware of the reality of politics in my world. It was so sad... But the sight of so many familiar faces showing their sadness and dejection as they left the Sports Hall made it difficult to be objective." In 1990 the International Games were again touched by a conflict going on elesewhere: this time the invasion of Kuwait by Iraq that year.